The Nissan Juke is one of the weirdest cars on the market, but it’s also way ahead of its time. What do you need to know before you buy a Nissan Juke? Don’t worry, we’ll tell you everything right here in the Ultimate Buyer’s Guide. The Nissan Juke is a lot like Austin. 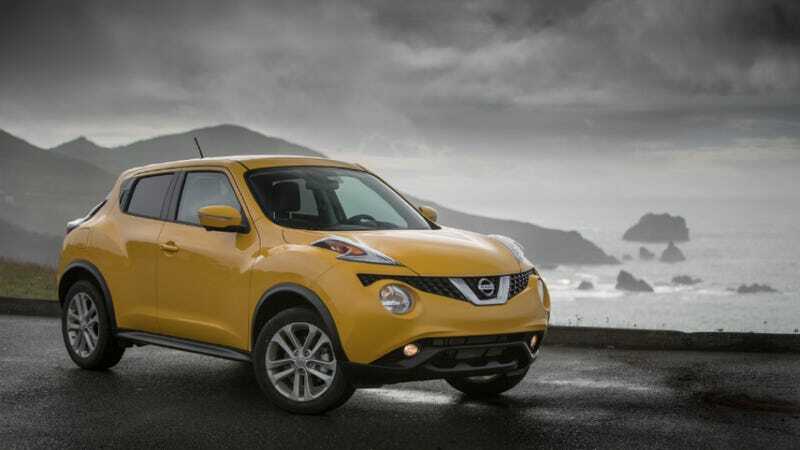 Its weirdness, its boldness, its pizzazz makes the Juke stand out from the crowd. But weirdness isn’t enough to make a great car, just as it isn’t enough to make a city like Austin great. Austin and the Juke both have lots of other, more practical things to offer than just peculiarity. While Austin has great food, a solid job market, and tons of nice outdoor areas, the Juke offers tons of standard equipment, a fun driving experience, and solid fuel economy. Weird and fun. A great combination. Not everyone needs a third row or, realistically, even much of a backseat. While the Juke looks relatively stout, it shares the same B-platform with some of the smallest cars that Nissan makes globally. It’s plenty fine for two people, but don’t expect to take five adults any long distances in this car. Introduced to the U.S. at the 2010 New York International Auto Show, the Nissan Juke turned quite a few heads with its quirky styling and stubby size. That 2011 model debuted with the same powertrain options as today’s car: a 1.6-liter turbo four with either a CVT or a 6-speed stick. There have only been a few minor updates since the launch. The Nismo model came in 2013 with revised styling, a slightly more powerful engine and a sport-tuned suspension. For ‘15, the Juke gets a slightly updated front and rear fascias with new projector-beam headlights, new taillights and a revised grille. The in-car communication system gets a tweak, and features like a rearview camera and push-button start become standard. The Nismo RS debuts for 2015 with bigger brakes, a sport-tuned suspension, Recaro seats, and a a tune that cranks 215 HP from the 1.6-liter. The Regular Juke Nismo sticks around but makes do with the base 188 HP mill. Also new for 2015, if you waned the 6-speed manual, you have no choice but to buy one of the two Nismo trims. All Nissan Jukes come with a 1.6-liter turbo I4, but it’s tuned differently for the Juke RS to produce more power. The lower trims get a 188 HP calibration, whereas the Juke RS gets a few more ponies at 215 HP (211 HP for the auto). All non-Nismo Jukes and all four-wheel drive Nismos get a CVT automatic, while all 2wd Nismos are graced with a 6-speed manual. 34 MPG. That’s a pretty impressive number. And you can buy a Juke with that kind of efficiency if you opt for the manual with the base-tune 1.6-liter. This means you have to buy the Nismo non-RS trim, since all lower trims come with the CVT and the Nismo RS comes with the slightly thirstier, more powerful engine. Still, even if you don’t get the 2wd manual Nismo, all trims are very frugal with gas, with only the all-wheel drive Nismo RS automatic scoring less than 30 MPG on the highway. All Jukes come with MacPherson strut front suspensions and electric power steering. In the rear, 2-wheel drive Jukes get a torsion beam rear suspension, whereas the all-wheel drive models get a multi-link setup. Front disks are ventilated 11.7-inch units, and the rears are solid 11.5-inch disks. The Nismo RS model, however, gets 12.6-inch vented disks up front and 11.5-inch vented rotors out back. Jukes come in five trims: S, SV, SL, Nismo, and Nismo RS. S: Base model. Starts at $20,250. Notable standard features: Front-wheel drive, CVT automatic transmission, 1.6-liter turbo I4, 17” aluminum wheels, NissanConnect in-car communication system with Bluetooth capability, automatic projector beam headlights, power mirrors, rearview monitor, air conditioning, cruise control, cloth seats, 6-speaker audio system with 5 inch monitor, front and side airbags, proximity keyless entry. Notable options: all-wheel drive ($1,850); 17” gunmetal wheels ($950); 17” black wheels ($1,055). SV: Starts at $22,300. Notable standard features over S: Power moonroof, premium cloth seats, automatic temperature control, leather wrapped steering wheel. Notable options: all-wheel drive ($1,850); Tech Package: Navigation with 5.8 inch touchscreen, six upgraded speakers, hands-free text messaging assistant, Around View monitor with Moving Object Detection ($1,490); Cold Weather Package: Heated side mirrors, heated front seats ($250); 17” gunmetal wheels ($950); 17” black wheels ($1,055). SL: Starts at $25,240. Notable standard features over SV: Navigation, 5.8 inch color monitor, Rockford Fosgate audio system, leather seats. Notable options: all-wheel drive ($1,700); 17” gunmetal wheels ($950). NISMO: Starts at $24,830. Notable standard features over S: 6-speed manual transmission, NISMO tuned suspension, 18” aluminum wheels, NISMO aerodynamic body kit, navigation system, LED daytime running lights, summer tires, NISMO sport bucket front seats, NISMO interior trim. Notable options: all-wheel drive and CVT ($2,400).